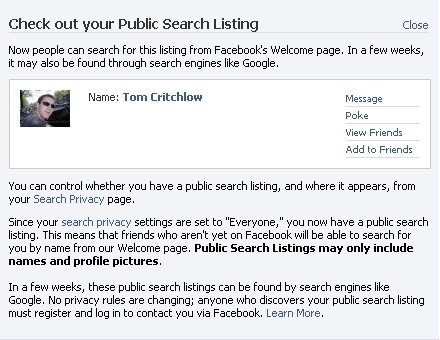 Facebook Public Profiles Actually To Become Public? I'll be keeping a close eye on this one - it'll be interesting to see what happens and which way they go. 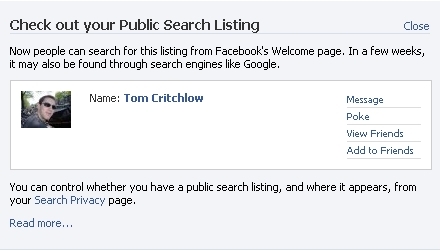 Currently, my public profile still isn't very public - the only search that it shows up for is [tom critchlow facebook] and even then it's 3rd! Update: Danny from SEL has written a great piece on this topic, check it out here. Also, John Battelle raises a very interesting point - if all these public profiles DO begin ranking, will Google onebox them? So many questions, so few answers! !